Growing beets is easy. Like other root crops, they require a nice, well-cultivated soil and a good supply of water, but little expertisse is required. Follow these simple steps and you will be harvesting baby beet greens or getting set to preserve some pickled beets. Little Egypt: One of the earliest maturing varieties currently available, these small, round red beets mature up to two weeks earlier than other varieties. Formanova: A large, elongated red beet exceptional for pickling. Chioggia Guardsmark Improved: These fun beets are an Italian heritage variety. They are red on the outside with alternating rings of red and white when sliced, each ring corresponding to one month of growth. Not recommended for pickling, but good as a novelty specimen. Albino White: Round, white, sweet beets with tasty greens on top. Blankoma: Another white beet, these are a heritage variety that is a nice all-purpose beet for eating fresh, cooking or pickling. Golden: An early-maturing, carrot-colored beet good for pickling or cooking. Planting beets in single rows will allow them maximum space for development, but you can save on time and labor by planting multiple rows along a single, wide seed bed. Cultivate beds 12 to18 inches (30 to 45 cm) wide, and plant two parallel rows three inches (7.5 cm) apart. If you prefer smaller beets or are simply harvesting baby greens, you can sow seeds even closer together to make the best use of space in your garden layout. 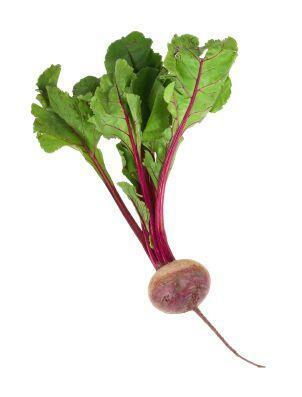 Beets are not particularly heavy feeders, but like a bit of well-rotted manure or compost worked into the soil. Avoid using fresh manure or incomplete compost, as the beet roots will become bitter and hairy. Work the soil and compost together, removing any large rocks or old roots to create an even, loose soil that allows the beets free room to grow. Stones or other objects will deform the roots or hinder growth. Using a small spade, create narrow trenches in your seeds bed. Each trench should be about 1/2 inch (1 cm) deep, or the depth of your first knuckle on your index finger. Sprinkle seeds two to three inches apart. Push the surrounding soil to fill in the trench. Expect your seeds to germinate in about eight to ten days. At this time, take a moment to thin out any seedlings that may have accidentally been planted too close together, or fill in any gaps you may have missed. The only thing easier than growing beets is harvesting beets. You can either pull the baby greens when they are just four to six inches (10 to 15 cm) tall, or wait for the beet roots to mature. Depending on the varietyof beets you have planted and the size of beets you prefer, this can take between 50 and 80 days. However, growing beets are fully edible at any point in their growth cycle, so if you can't wait that long, simply pull up a few baby beets to steam with supper as a summer delicacy.